The 2011 Harley-Davidson Sportster 1200 Low XL1200L is powered with a 1200 cc Evolution engine, the crown jewel of any Harley motorcycle. With a slammed suspension and lowered Harley-Davidson Sportster solo seat, the Harley Sportster 1200 Low has a custom motorcycle look. When sitting on the bike, your hands are on the stainless steel pullback bar and feet placed on the mid mounted foot controls, putting you in a comfortable and confident ridding position. Take some time to review all of the features and specs of the Harley-Davidson Sportster 1200 Low and find out why this custom motorcycle is a must see. Learn more about some of the other Sportster custom motorcycles including the Harley Sportster Iron 883 custom motor bike and the Nightster that has a vintage motorcycle look. Every Sportster offers a true Harley experience. Find the Harley-Davidson Sportster motorcycle you want to ride most! Also take a look at the VRSC motorcycles, the Night Rod Special motorcycle cruiser and V-Rod Muscle power motorbike. 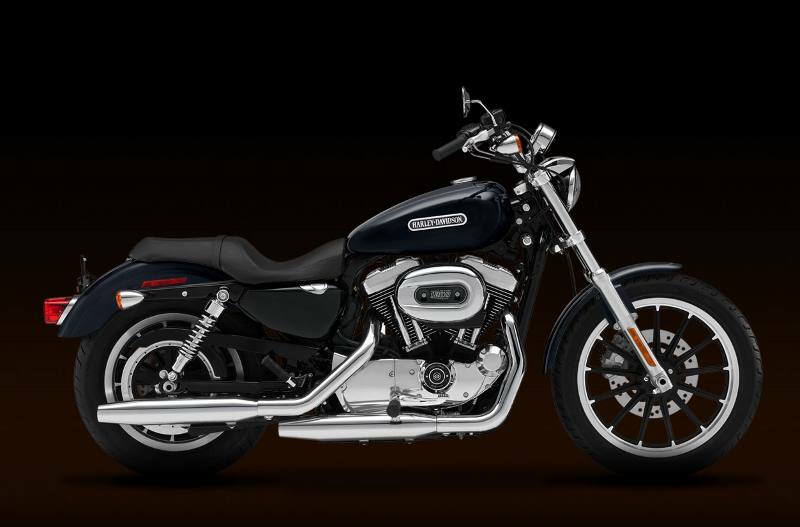 Currently the longest running Harley-Davidson® family in production, your 2011 Sportster® motorcycle is a narrow, nimble and no-nonsense machine that brings a whole new level of fun to every lane, alley and corner you take it through. All the best action happens at street level, with low seat heights and agile handling, these motorcycles get you closer to it. Premium styling features: For over half a century, the Sportster® has remained true to its roots. Its unique, authentic styling and premium finishes are the pure essence of the sport, uninhibited and just plain fun. The Sportster® 1200 Low motorcycle is no exception. The 4.5 gallon walnut fuel tank shows off the thick, premium paint and there's just enough chrome to make the bike pop. Bolted in the gut is a gorgeous 1200cc engine with chrome rocker covers that packs a serious punch--and unbelievable experience for an incredible value. This bike proves, once again, that meticulous attention to detail and exceptional quality never waver at The Motor Company. Evolution® engine heritage: The Evolution® engine--known in certain crowds as the Blockhead--was first bolted to the frame of a Harley-Davidson® motorcycle back in 1984. Born from legendary Shovelhead and Ironhead engines, the Evolution® engine broke new ground in displacement innovation while maintaining the hunger for power, durability and proven reliability that The Motor Company was built on. Evolution® engine innovation: Air-cooled and durable as hell, the 1200cc Evolution® engine is yet another nod to the unwavering work ethic that drives advancements in motor technology at Harley-Davidson®. Aluminum heads and cylinders lighten the load of the bike and improve air-cooling efficiency. Electronic fuel injection says goodbye to carburetors and boasts increased reliability and less routine maintenance. Bottom line: the rubber-mounted Evolution® engine runs hard and rides smooth for thousands of miles so you can just worry about taking in the freedom of the open road. Pure Harley-Davidson® styling: Feast your eyes on the 1200cc Evolution® engine and there's no mistaking its roots. This is authentic Harley-Davidson® style through and through with an attention to detail you won't find from any other motorcycle company. Medium gray engine with black powder-coated cylinders and cylinder heads are topped off with polished rocker covers. It's a jewel machined out of metal. Pure. Dripping with power. From the classic edge of the cooling fins to the clean lines of the cases and covers--the 1200cc Evolution® engine makes an ironclad statement to holding on to what's right and staying true to what satisfies the rider. Low seat & suspension: The combination of a low front and rear suspension together with a low, narrow seat provides comfort and confidence for riders of all sizes and experience. The one-piece, two-up Sportster® classic seat sits at just 26.3 inches from the ground and features a narrow nose, low forward profile, small passenger pillion and rear Sportster embroidery. The adjustable suspension keeps you close to the road, while power and performance take you to new heights. Pull-back handlebar: On the 1200 Low model, the relaxed stainless steel pullback handlebar is about an inch closer to the rider to allow better reach and provide a laid-back riding position for comfort and cruising. When you sink into the saddle, your arms fall naturally on the handlebar. Mid-mounted controls: Let your boots fall where they may, naturally to the mid-mounted controls and rider foot pegs on the 1200 Low model. An easy reach and tight rider triangle is confidence-inspiring for new riders eager to set off on their journey and riders whose legs run slightly shorter than others.